History of the BB in Anderston . John N Cooper BB Officer.......I first met John in the late 1970s when he was involved in Boys' Brigade Bands at Glasgow Battalion level. He was in charge of the Glasgow Battalion Brass Band and the Bandmaster of the 32nd BB Company Brass Band. At our first meeting his love for the BB and his love of music was very evident. BB bands are and were very difficult to maintain, for the simple reason that Boys grow-up, leave the company, putting the band back to basics as you continually strive to bring new boys through to keep the band 'alive'. My BB company ( 219th Glasgow ) was working very hard to keep our flute band 'on the road' and John was a great inspiration to me by encouraging me to bring my Boys along to various local and Battalion events. This stimulated great interest with the Boys and from 1978 to 1983 my band was ever present with The Glasgow Battalion Brass Band....and John. he really was and is a wonderful Glaswegian. world about this book/CD he has written. 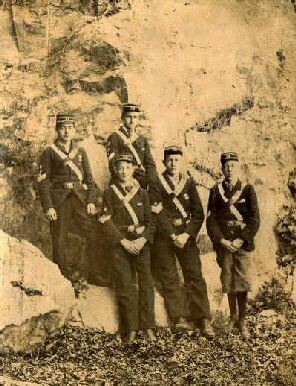 Photograph - Sergeants of the 32nd Glasgow taken - 1892 Numerous histories have been written recounting the story of The Boys’ Brigade (BB), indeed a number of BB Companies have produced localised versions of their own history. To date, no attempt has been made to record the collective presence and work of the various BB Companies who were active in the Anderston area of Glasgow . With the invaluable collaboration of Jim MacKenzie, current Captain of the 231st Glasgow Company (a former Anderston Company), and contributions from a number of other ‘BB people’, I am taking this opportunity to bring together our collective knowledge of The Boys’ Brigade in the area in which we grew up - Anderston. Wherever friends gather, thoughts and conversation often turn to the ‘old days’. Few take time to consider that unless such reminiscences are recorded, they simply disappear. The very mention of the BB will invoke memories of time spent in the Organisation among every ex-member, who will have recollections particular to specific interests be it, Football, Camp, Band etc.. Thinking back to the days of our lost youth is what makes memories, or nostalgia, so potent. Those days cannot be brought back, but memories can be revisited. That is partly the reason why this history has been written but, perhaps more importantly, it is an account that will be available to future generations. This record of the BB in Anderston will provide not only documentary evidence, but will offer insight into how the Organisation worked and what it meant to be a member. Every BB Company had to have a Church connection and, whilst the future of the BB in Anderston today may be somewhat uncertain, what is not in doubt is the tremendous influence the Organisation has had on thousands of youngsters who passed through the ranks over the years. It is well nigh impossible to fully measure the impact The Boys’ Brigade had on the youth of Anderston; suffice to say the Organisation offered thousands of young lads direction and a positive outlet for theirs energies. The BB was an important part of growing up for many Boys and, through membership of the Organisation, countless lifelong friendships were established. The opportunity for Boys to develop and express hidden untapped skill was encouraged by their Officers, every one of whom was an un-paid volunteer. The positive influence of the Officers and Leaders, who often became role-models to the Boys, is incalculable. This history is dedicated to the thousands of Officers, Instructors and supporters who devoted their time, skills, energies and resources to the work of the Boys’ Brigade. Whilst this history is primarily focused on the Anderston district of Glasgow, many of the reminiscences will no doubt be applicable wherever in the world the BB had a presence for they, too are “All Part of the Story”. John N. Cooper, Glasgow, October 2004.
is available in book & CD format and can be seen at the Mitchell library.